UVI The Beast is inspired by the 1975 machine that influenced many of the avant-garde artists of the seventies and eighties such as Frank Zappa, Sting, Kraftwerk, Stevie Wonder, Michael Jackson, Depeche Mode and more. Using electronics developed for NASA, this instrument was revolutionary for its time. Starting off its life as a gorgeous FM synth, it evolved into a comprehensive workstation through subsequent expansions. 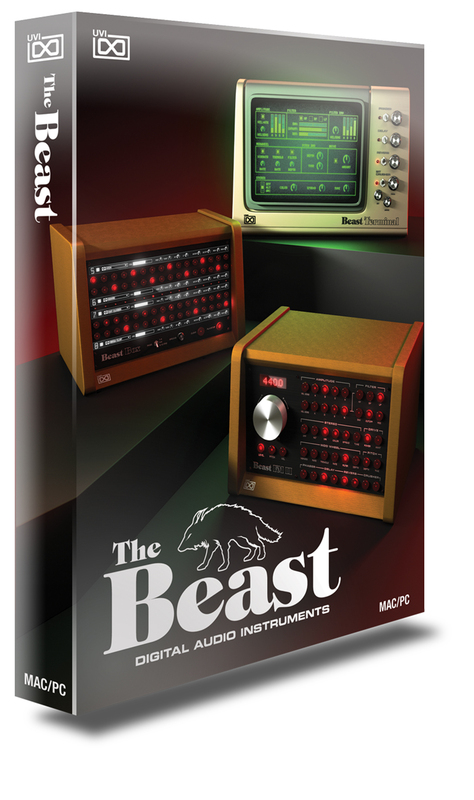 The Beast embodies the timeless sound of these vintage, luxury electronics delivering a rich and expansive sonic range that recaptures the past and inspires the sounds of your future. An FM and additive synthesis monster: As a result of UVI´s combination of deep multi-sampling and integrated true FM synthesis module, this instrument offers a unique approach to reproducing these vintage sounds, allowing for subtle to extreme variation. With careful attention to historical details, the presets and sonic character of Beast Terminal traverse a wide territory. Ranging from acoustic to electric, they encompass the full sonic spectrum: from lush strings to strikingly bright brass timbres and beyond. Combining the best FM-synthesized percussion sounds with recordings of the deepest drum hits and percussion samples, Beast Box is a massive drum machine with an extensive library of over 1200 sounds. SparkVerb, which is a highly advanced synthetic reverb developed by UVI, is also included in this software package. From Stratospheric choruses, to lush ambiences and resonant unisons, SparkVerb offers a huge palette and control over the patches. Thoughts on the Arturia MiniBrute 2 – Can it Sound Smooth?